I cannot comment to the Pro's level. As far as I am concerned it is very high quality, it's got the Lamborgani power & Rolls Royce smoothness. From my 1st film Nikon Nikkormat,F80,F100, D70s,D50 to D90 each & every camera was built & produced Top Class. Especially the build quality is Matchless. So nothing to fret about since the D90 is again a classic & top quality camera in all respects. I am In India & when I visited my son in Australia bought me the D90 in Melbourne in May 2010. Any where in Australia what ever U buy anything for the matter the customer service is #1. Especially all the camera dealers, established & authorized camera dealers are 200% friendly, pleasant & enterprising persons. Quick Auto foucus Nice "Tack Sharp " Photos Easy to understand and to use.Not too heavy and is pretty well made. Features; build; design; performance; image quality; and also price when you consider how much more you'd have to spend to notice any significant difference. AF-tracking struggles with fast-moving subjects (the 11 AF points can constantly hunt and fail to maintain any useful lock... but then that just encourages good technique! ); and the video mode is too limited to be really fun or useful. I've used it for over a year now, mainly for outdoor and wildlife photography, in the UK, the Falklands, and Antarctica, and it's hardly ever fallen short. It just always performs and is completely intuitive to use. It also has a great depth of controls and features, so you can tailor it to your needs and preferences, and I’ve done A3 prints from it with stunning quality. I’ve compared results to a friend’s D300 images and we really can’t tell any difference, though the D700 images have a bit more to them. With that and also comparisons to other friends’ equivalent Canon and Sony systems, I’d only ever consider upgrading to a full-frame sensor model as I reckon this is about as good as DX sensors can get without squuzing yet more pixels on and creating noise issues. and anything in-between would be money better spent on lenses. The only feature I’ve ‘missed’ is a more advanced AF (like the D300’s 51-point AF system) to help with tracking fast-moving wildlife, but that’s on 1% of the time. It feels a bit light and small to my taste, especially with larger lenses, but that's soon fixed with a battery grip. hi Readers& Viewers i am using D90 Camera. the picture and the quality is very good. The response i am getting by D90 is very good. i have purchased VR lens 18mm-105mm. the lens is very good. 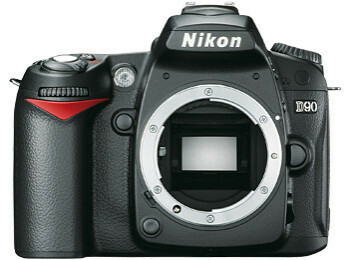 Superior image quality, hardware durability, Support from Nikon. Is all but impossible to beat the quality for the money Nikon will give you. Yet the lesser brands will give you options and attributes as standard function Nikon will charge you dearly for. You get what you pay for but where the competition can do it, why not Nikon? Yet what ever you get on your Nikon you will have a superior product that will last you many years. Some functions are very awkward like starting and stopping movie mode. To recharge a battery it has to be taken out, another work load. The Nikon D90 camera is the best one I have ever bought and have had some very high end stuff in my life. Technology has come a very long way. It replaces the Sony MVC CD500. The old one has some great attributes the new one does not have. One is the self timer where I can set the camera on a tripod, set the timer and stand back to take a pic of myself or something. The Nikon does not have this unless you buy at least one option. One is the Infrared trigger to set the camera off. And if you shoot inside, you need the double shoe option so the infrared that sits in the flash shoe can occupy one shoe while the flash the other. Another thing is the Nikon offers only 3 different size pictures, 3, 6, and 12 meg size in either JPG format or the Nikon NKX (or something like that). So this limits your size capabilities without resizing every shot. I suppose pro want the most mega pixels, but I don't. Smaller sizes work just fine and even make quite attractive 8 x 10 blow ups. The 12 meg will make poster size but also will use up a ton of disk space to save the pics. The Sony will allow you to set your pic size from about 80K standard/160K fine on the low end to 5 meg in 1 meg incraments giving you allot of choices. I use the low end fine for almost all shots and that works fine. I will have to resize ALL the Nikon shots to compress storage size on the hard drive. Another is the format type. Either JPG or the Nikon file type. If you use the Nikon file type you can use their software to manipulate the picture, but a good JPG picture program, and there are many even free ones, that will do an excellent job of the same basic thing so Nikon format is not needed. I don't see any advantage on editing raw format for the JPG editors that are out there. I use CompuPic which works quite well. Is not Photo Shop but does everything I want! I had to uninstall all the Nikon software where it simply took over my computer for photos and I have other things I use that work just fine, some basic ones are from Microsoft! The basic XP platform will 'see' the camera as another hard drive where you can copy and paste from the camera to the computer and do what ever. The Nikon software is not needed so I got rid of it. The Sony makes taking movies such a simple task! Just twist the dial on top of the camera to Movie and snap away! First snap starts the movie and second stops it giving you total control. The Nikon needs several buttons to start the movie and they are on the back of the camera making manipulation of movie start and stop a chore that could easily, way too easily mess up start and stop portion of the movie. The AVI the Nikon takes is extremely sharp, like a high end movie camera so in that aspect it is better than the Sony but that is the only advantage. Sony movies are fine in MPEG format, the eaze of the Sony makes it a far better choice but if you want quality of image the Nikon of course is the better choice. The Nikon offers a huge variety of lenses, the Sony has the built in plus a few external filter thread screw on aux lenses which work fine for the amature photog, the pro of course would frown deeply at that and dive for the Nikon. I have several add on lenses for the Sony and they work great for me. One in particular is super, is a semi fish eye that is fabulous for inside shots where it will take your subject, floor, ceiling and walls side to side getting the whole thing, if that is what you want. Any fish eye will distort the image but this one does not do a terrible job of it leaving the picture as is with distortion all but beyond notice. The Nikon I bought came with an 18 MM to 105 MM lens. This is pretty much a good all 'round lens but others are definately needed for more cultured shots. Pictures are sharp as a razor and color is more than perfect. Batteries are another issue. The Sony has a wall powerd charger to a small 'brick' transformer you plug directly into the camera. The Nikon has a small wall powered charger but the battery has to come out of the camera. Set up in the camera is in CMOS so nothing is lost when the battery is removed but is a bit awkward. So the Nikon has far superior lenses. The Sony is a great amature camera. The Nikon shutter launches almost in a nano second taking a picture. The Sony has a lag of about a second and that makes some difficult shots hard unless you use burst. Nikon has burst also so both work fine. The Nikon is better of course because of the speed. The Nikon is totally manual as were the 35 MM cameras if you choose as well as manual. The Sony is manual but not to the extent the Nikon is. The Sony requires allot of set up for manual shots, the Nikon is only a flick of a switch and away you go! Again, the Sony is best for the amature and the Nikon is for the pro where it has all the stuff in a camera a pro will need. The Sony in full auto works perfectly as does the Nikon. Haven't sent any Nikon pics to the printer, but I have a very high end printer so they should come out better than Kodak right here in the house. Especialy if I use the large mega pix size you should be able to count the cells on a person's arm from 200 feet! Ha! For all 'round use the Sony takes the cake. For more professional, accurate and detailed shots the Nikon takes that one. The Nikon uses SD Flash Cards for storage which is fast and no moving parts. The Sony uses mini CDs which in time will wear out and need expensive service. I have used only two CDs the whole 4 years I have used the Sony, they are CD-RW so when they get full I format them and start again. All my photos are saved on a dedicated hard drive partition and down loaded directly from the camera soon after the shots. The camera is used for that, on the Nikon I use a Flash Drive Adapter in a USB port to format the cards. Works great! So of the two which is the better? The Nikon has the advanage but the Sony has definite qualities that do not throw it out of the park. A little soft depth of field. From out f the box, the settings is ok. I tried the video and quite nice and surprising. It's a good beginner's SLR. No AF in D-Video mode. 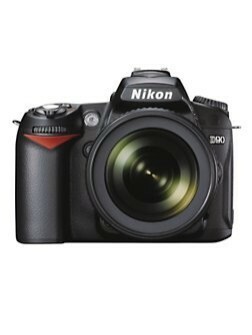 Bought the Nikon D90 in Jan.'09 as an upgrade to my much loved D80. Right out of the box I noted a major improvement in image sharpness. It’s unusually fast as well, able to fire numerous JPEGs in a single burst when using a fast SDHC card.I really like the new feature of 3D Focus Tracking in continuous autofocus mode for great reliability with action subjects. The D-Movie mode is fun and I found it useful for shooting clips during family events using a VR lens (with image stabilizer) to correct for camera shake. As long as I did not pan too quickly, video quality was very good. the Scene Recognition feature. Most of the “post processing” options are quite intuitive. During extensive nature, action, travel and portrait photography, I found the D90 to be unusually fast, reliable and versatile. 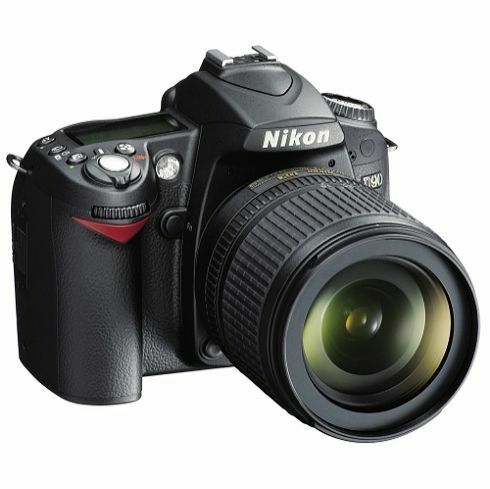 While HD video capture will not be of interest to everyone, the Nikon D90 is a very desirable camera in more conventional aspects, making it a perfect choice for photography enthusiasts. I love it,In terms of image quality I'm impressed. Highly recommend this camera. 1. Large viewer. On the D70s found picture sharpness was occasionally a problem. At least with a large enough viewer you can see your pics well-enough beforehand so you can take the picture again until you get a good shot. Otherwise you enlarge it on the computer or TV later and found that it is a touch out of focus you missed the shot. 2. Air filter. You still need to blow the back of the lens occasionally to remove dust but at least dust won't be picked up by the sensor. 3. Size. Compared to D40 & 60 some people may find this camera a bit on the heavy side but not as much as the 300 & & 700. Compared to the D70 they did manage to trim a fraction of an inch off the length and still offer more features than the older SLR. 5. Movie mode convenient: turn your Preview on, press [OK] instead of your shutter release and you can start recording your movie right away. 7. WB: included an extra K (color temperature setting) when used with Preview on allows you to match with the saturation of the scene (not too warm or cold). 1. Certain buttons can only activate with the Live Preview off: the WB can be adjusted either way. After taking a shot you press the Play button or while taking the shot you wish to adjust your ISO your Preview must be off... otherwise won't work. A bit of inconvenience pressing an extra button. 2. Live Preview: can still be improved. Several years ago used a Canon S45 P&S digital (on the same line as S70 & S90). Was on vacation with the S45 and a film SLR. Took a few shots in a hazy morning with a low sun. The preview on the S45 saved the day. The preview allowed you to see your exposure changes as you adjusted it manually on M or by compensation -2, -1, +1, +2, etc. On the D90 however, the viewer doesn't track exposure changes (only the changes to the White Balance). When you are doing action shots you don't have time to take the picture again if the exposure is off. A bit of time-lag between taking the picture and when the Preview is switched on again. If you set the [Image review] to on, you get a 4s delay. Even the Image review feature is turned off, after taking a picture there a 1.5s delay. And after every shot the Preview turns back on, you get a distracting loud click as if you just took another shot. Actually it is just your mirror moving back up to the lock position. 3. Paying for the privilege to use 3rd-party lenses: Nikon knows their lenses are more expensive and that they're not always better than a 3rd-party equivalent. A lower down SLR such as a D40 or D60 you get enough mpix for a good shot but must use Nikkor lenses or some of the lens features such as auto-focus may not work. Here you are paying a few hundred more so that you have the option of using Sigma, Tamron, Tokina and other brands. 4. VR: can be useful in low-light or with long lenses. Considered cameras such as Sony Alpha with Vibration Reduction in the body better because you can put any lens on top and still be able to get the shake-reduction. Canon & Nikon people with their Anti-Shake feature on the lens will tell you that you get a better performance if the vibration feature is calibrated for each specific lens. Sony took over Minolta a few years back and adopted the Maxxum technology. You can supposedly still use an old Maxxum AF lens (that came with your film camera) with your new Alpha and still get Vibration Reduction. With a Nikon, you'd need a VR lens to get the feature. 5. Price: compared to other SLR manufacturers such as Canon, Sony & Olympus tend to consider Nikon a bit over-priced. They are counting on their good name and reputation to do the sales pitch so even in a recession tend not to reduce the price of their products as aggressively. Traded in an D70s for a D90. Was looking at the outgoing D80 but found that besides the higher mpix count, the other features were too close to the 70 so went with the newer 90. 1. The suggested retail price is only a guideline. Even in a recession some stores will sell a bit cheaper to get more product out the door. 2. Throw-in or extra: depending on the store. If the store have a very low advertised price, chances are they won't throw in anything extra. If a store sells the camera at a higher price, you have room to negotiate. The items you are most likely to buy extra: a camera bag, a neck carrying strap, a memory card & a filter for your new lens (at least a UV). Besides the memory card the other 3 are good to have but not a necessity. Even a memory card you can negotiate with the vendor or buy it at an electronic store for cheaper. 3. The package deal: camera with lens together. Usually 18-55 or 18-105 Nikkor lens. If you want to keep a lens still usable from your previous trade-in, the retailer may not give you as good a deal. 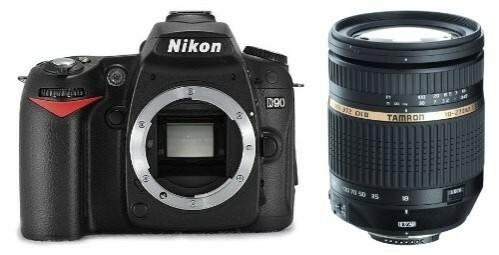 Nikon knows the D90 allows you to use other lenses (Sigma, Tamron, Tokina) but to get you to buy a Nikkor with your new digital they temp you to go for the deal. You get a large (tall) box with lots of packaging inside: the SLR, battery, software and a Nikkor lens on top. 1. Air filter. Even with occasional lens changes, the camera sensor on the D70s acts like a magnet and attract dust that shows up in your final pics. 2. Live Preview. For shooting at odd angles where you don't need your eyes on the viewfinder. Occasionally you are behind a crowd of people and wants to shoot over people's heads you can at least see what you're getting. The Live Preview turns on & off with the mirror-lock. I have used the Nikon for 3 months now. I've taken some great pictures and some not so good pictures while I experiment with the variety of settings it offers. One feature I find myself using very often, almost automatic now, is the "white balance". I'm hooked and just bought a new prime lens for good portrait photography. Highly recommend the Nikon D90.